Islamabad (Wednesday, June 4, 2014) – Yesterday APCA announce rally from press club Islamabad ti Parliament House Islamabad. At least seven people were wounded when the district administration used force to disperse the protesting officials who staged a demonstration against the current budget at under-construction Jinnah Avenue near Shaheed-e-Millat Secretariat Wednesday. The police freely used batons, hurled teargas and shot rubber bullets to scatter the protesters. All Pakistan Clerks Association (APCA) staged the protest-demonstration to register their anger against the annual budget 2014-15 in which the salaries were increased below their expectations. 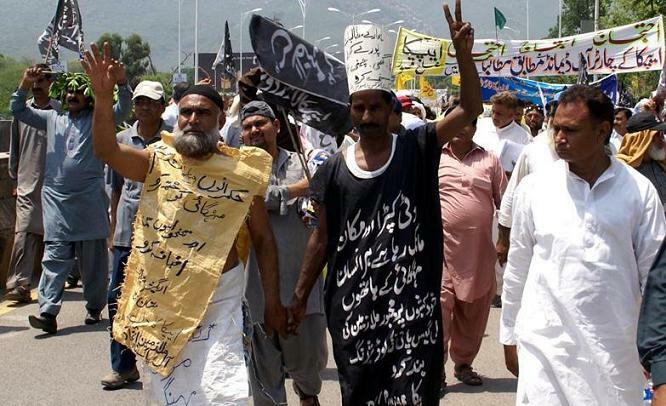 Hundreds of protesters under the banner of the APCA gathered at the intersection of Embassy Road-Fazal-e-Haq Avenue intersection at about 2 pm.The protesters were holding banners and placards. They started the protest from the Fazal-e-Haq Road and marched towards the Poly Clinic. However, heavy contingents of armed police cordoned them off and pushed them away to the security zone. The protesters tried to come back to the D-Chowk which was closed for Metro Bus road construction. The police intercepted them causing a clash between the angry protesters and the police. The police tried to stop them but they become uncontrolled when the duty magistrate ordered the police to resort to baton charge, followed by severe shelling of teargas. The police also shot rubber bullets on orders of the magistrate resulting in injuries to the participants of the mob. The protesting people scattered for the time being but gathered again at different areas around the Jinnah Avenue. Hide and seek between the protesters and the police continued for hours. The protesting people kept chanting slogans in favour of their demands. The APCA leadership claimed that the poor employees of the government departments were humiliated by the police and administration by using force against the protesting people unnecessarily who came out in favour of their genuine demand peacefully seeking justice according to their democratic right. They said that the elderly participants of the rally were tortured inhumanly during the “operation against poor clerks,” adding that they would keep struggling till getting their basic rights to live.The police arrested 29 people including the APCA leadership during use of force and shifted them to different police stations where cases have been registered against them. Khalid Iqbal adds: Rejecting a meagre 10 percent raise in salaries of government employees, the protesters were demanding a 50 percent raise.They were beating their chests for no announcement of a handsome raise in their salaries according to the increasing inflation percentage. Some of protesters became unconscious due to hot weather but they continued their protest demonstration. After scuffle with the police, the protesters succeeded in reaching China Chowk and staged a sit-in raising slogans against price-hike.APCA General Secretary Mukhtar Ahmed Gujar termed the 10 percent salary raise announced for the government employees a mockery and cruelty as compared to the skyrocketing price-hike in the country. 50% Basic Pay Scale may please be revised. it is requested that 10% adhoc relief 2013 shall be continue in budget 2014/15 instead 10% adhoc relief 2014. .